Some of the services we can provide for you! Here are some of the services we provide at Apple Appeal, it is important to note that we do not handle restorative care such as fillings. If you have any questions regarding the services we provide please do not hesitate to give us a call at (403)453-2007 and we will be happy to assist you. Digital x-rays are a great example of innovative next technology in the dental field, they provide a clearer image with much less radiation. This digital x-ray can be sent to your dentist if the results indicate that you require further attention. In office, involves 3 - 8 minute sessions of an active ingredient applied to the teeth. Product boasts little or no sensitivity. If you are experiencing some gum sensitivity we can help aleviate that with a product placed under the gum (without the use of a needle) to provide temporary numbing of the appropriate area to make your experience more comfortable. 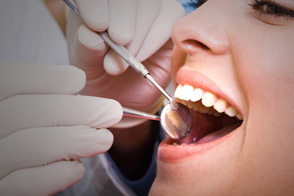 Is performed with the oral exam, we use a vel scope to help detect oral cancers. If we detect anything unusual we will refer you to a specialist. If you require restorative care or other services not provided by Apple Appeal we will be happy to refer you to a trusted dentist in the area.